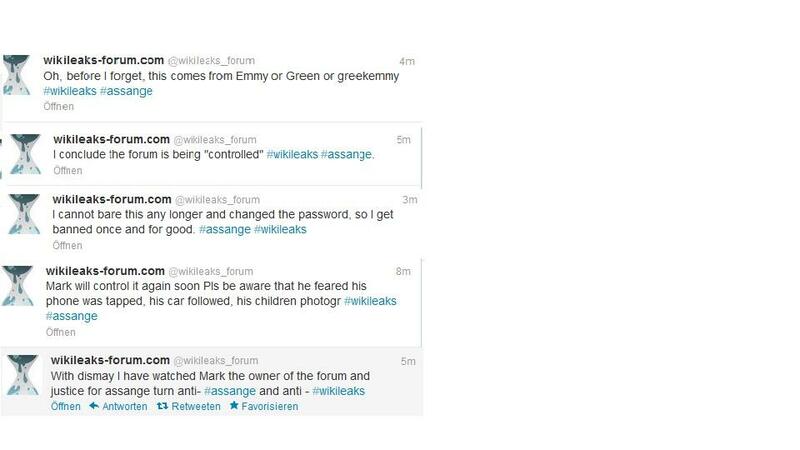 After the discussions described here:http://wp.me/p2MRYW-f &http://wp.me/p2MRYW-p attacks continued towards WL supporters Jaraparilla and Cabledrum via the WikiLeaks-Forum Twitter Account. In telephone conversations I had with Mark his dramatic change from WL/JA most ardent supporter to anti-WL/JA was accellerating leaving me doubfounded and numb. In the morning of the 22nd of August 2012 I checked my twitter feed in my i-phone and again I saw new attacks being made against Jaraparilla. The fact that the attacks were being made by individual (s) hiding their identity behind the generic identity of the forum’s twitter account was cowardly. Mark and whoever else was doing it were using the wikileaks-forum twitter account to saw fear, uncertainty and doubt among WL/JA supporters. I could not be part of this. At the Forum’s Facebook Staff Room both myself and another had raised the issue and to me at least the response was unsatisfactory. There was no point in raising the issue again when my telephone conversations with Mark revealed that his change into an anti-WL/JA was beyond doubt. I had to do something to once and for all cut all links with Mark’s circle of control and withdraw my support to him that I felt legitimised him. Up till that point, the work that I did for the forum as a moderator, being one of many admins at http://www.support-Julian-Assange.com, co-admin for some of the WL Facebook pages he had created and controlled, using the Forum’s twitter account to tweet forum links were all helping him in my modest way in supporting the WL community of WL supporters. His current behaviour indicated that he not only did not support but he was using the tools available to him: eg the forum’twitter account to do harm. “I have tried to change the passwords so that I get banned and sever all links / Mark the owner of the forum no longer supports WL/JA so I cannot support him / He might have no choice in what he does / he was concerned his phone was tapped, his car followed / his children photographed / btw I am Green/greekemmy / I conclude the forum is controlled”. Soon after that my access to the WikiLeaks-Forum Twitter Account stopped. My tweets were already gone, only the last one remained for a while. oh well…..if I find out who hacked the twitter account I will definately press criminal charges against this person for mentioning my children. This puts me and my kids ( although they aren’t small anymore ) at great risk. Here are the promised screenshots of the twitter account that was hacked. The password was changed and the person tried to change the master email account. “Why dud u put me and my kids at such risk? Did i ever attack you personally? I was then removed from the Facebook WikiLeaks Forum Staff Room Group. As soon as I was back from my holiday I put my “Green” account on the deletion queue. A few days later I did the same with my “greekemmy” account. In my quick visit I noticed that warning levels had been put in my account (in other words I was on the route for banning) and could not post or send Personal Messages. mail address ************* My last conversation with Mark was on the 22nd. I am satisfied he completely understands my reasons which are not personal. We have agreed to disagree in our support for Julian Assange. I do support Juian Assange, he doesn’t any more. He is entitled to his views, but I cannot be part of his team anymore. Greek Emmy Since I am no longer an active member of the forum, I will understand if anyone wishes to ‘unfriend’ me. For me, it is not personal. Emmy if you feel the need to go … Go …but it’s not true “he doesn’t support Assange” bcs he Pays for Support Assange platforms – Emmy… My best friend/sister too has doubts on JA, that doesn’t mean she doesn’t support his Human Rights… I’ll shut up my mouth here but let’s try to be objective: I’m Human, JA is Human, … who is “perfect” here a part from the ideas? There is no fully black or white when it comes to Julian Assange support, there is really a lot of greys. One thing is for sure, someone like Assange facing what he has to face- does not need to surround himself with enamored supporters that have the warped thinking patterns of any blind following. In order to accomplish the enormous task he has undertaken, he has to do what can be hard. He has to be able to allow people to critic him and in no way would he benefit from not listening to them. People that follow him blindly are hurting him much more than any critics at this vital time. In this way, the true anti assange crowd could very well be some of his most ardent supporters. Friend A I certainly don’t want to unfriend you Emmy. I have to confess, I am troubled, and not too clear about what has transpired. Stuff about whether someone supports JA or not. Personally I support Wikileaks, and because of the enormous personal sacrifices JA has made for Wikileaks, I will also support him. I support Kristinn Hrafnsson and all the other members and supporters of Wikileaks, but who cares about that?. I somehow feel that this episode has a whiff of ‘divide and conquer’ about it. The forum after all, had no executive function, but was just a place that like-minded individuals could share ideas – like the tea room at work ! Consequently, it really doesn’t matter whether you are a member of ‘the club’ or not … it is what you believe in your heart that really matters. All the organisations – WL – Occupy – Indignados, have never been about people being active – they have all been about people being aware and supportive. Friend B Greek Emmy Feel with you….. Sorry that step has become necessary. You surely have very good reasons to do so. You noticed i’m not active any more because of lack of time, still i often think back and remember you did a lot to the forum. Wish you all the best! Greek Emmy Oh, I just noticed that my above post has been twitted by the wikileaks-forum.com account, to whom I owe this honour? or are we going to play hide and seek again? 🙂 Mark After I placed my jabber conversation with Julia here and her e-mail to me here in my private Facebook page, you sent me this message on my “what’s up” application: “Emmy, please have the decency to not publish Julia’s personal details in the web. You are putting her at risk by publushing her email and jabber account. She never gave u any reason to do this to her,,,, plz think this over; thAnx mark”. Now you have tweeted the above mentioned post truly to the web containing my e-mail address. Let me say straight away: I forgive you and hold no ill will against you or any member who acts on your behalf. All I want is to disassociate myself from your forum since you are no longer an Assange and WikiLeaks supporter and I am sadly convinced that you will use it to harm the cause that means so much to so many including myself. I will have no part in this. Please delete both my accounts and let’s all move on to whatever everyone choses to do. Many thanks. Emmy, since you have not answered my email or even address my post here on facebook about these matters that you keep mentioning, it is quite clear to me that you have no interest in paying me that respect. No problem, I will just keep addressing these points without your dialogue input to me. Even though you express that you are convinced that Mark no longer supports WikiLeaks or Julian Assange and that constitutes only your one opinion, the gravity of what you are saying is much more far reaching and potentially damaging to the point that it is painting you as very vindictive person- I don’t care how sweet you write these replies. You know what you are doing and your continuation of this campaign against Mark is sickening to me. This is only one of the many actions that show your true intent. You keep implying that you want to go quietly yet you tried to hijack the forums twitter account- I have seen the screen shots. That is far from going quietly. The exposure of peoples personal information that you have exposed here- after you have addressed me in times I wasn’t being careful enough about your information?- unbelievable! Then this whole debacle of a situation of your forum account being banned on the forum- What is this crap>>> Silenced as usual: @wikileaks_forum has silently banned their most prominent moderator Green from posting “.<<<Are you condoning this? Because if you do- there is more than enough witnesses and proof showing it as absolutely false! My post will continue as long as you continue this passive aggressive vindictive campaign of yours and remember I can see right through every single sugar coated post of yours. Yep, it looks like I am the bad one here doesn’t it, like I may be the vindictive one here. Go ahead paint me black, come on do it. I can take it. Greek Emmy I understand my accounts are now deleted. Goodbye and the very best of Luck. Greek Emmy No, since I have just unfriended him. The end of an era *phew*. And this is the end of 18 months of being a member and 9 and a half months of being a mod at what started as “The Official WikiLeaks Forum” and ended up as the anti-wikileaks-forum courtecy of its owner and his new “objective” friends. Why do I make public now this account of events that made me leave the forum? Because since I left I observed further changes at the forum that confirmed my thoughts that it was becoming a vehicle of hurting the cause and people I support. Therefore events that were known only to a very small number of people, should now become public to help understand what is going on. By throwing light to my personal story it might help others understand that a campaign of Fear, Uncertainty and Doubt ( http://en.wikipedia.org/wiki/Fear,_uncertainty_and_doubt ) is now at work at the recently re-launched “The WikiLeaks-Discussion Forum”. Let’s try and keep our vision clear. Post script: twice I posted these 4 posts in paste bin and twice I seem to have lost them. I decided to put them in this blog, which is my very first attempt in doing something like this. I hope it works and gives a home to these posts as well as many others in the future. Thanks, Emmy. These idiots need to take a good long look at themselves.